Take lashes to new lengths with Eyeko's Travel Size Yoga Waterproof Mascara, a vegan mascara that conditions lashes while lifting, curling and extending with lasting effect. Utilising award-winning Korean technology, the black mascara locks in colour and hold for 24 hours, lending lashes a lifted and enhanced appearance round the clock. Completely waterproof and 100% cruelty free, the ultra-conditioning mascara contains Matcha Green Tea, 11 botanical fruit extracts (including Strawberry, Blueberry, Blackberry) and antioxidant Vitamin E to care for lashes while lengthening and curling. The innovative new brush design is inspired by the Lotus Flower. It has a straight tip to catch shorter lashes, and a bulbous, denser section for creating extreme curl and volume. Lashes will appear lengthened and extended with superb lift. Housed in a zero-waste squeezy tube. Does not contain fibres. Comb wand through lashes. Repeat to build and create desired effect. Isododecane, Trimethylsiloxysilicate, Microcrystalline Wax, Polyethylene, Disteardimonium Hectorite, Silica, Dextrin Palmitate/Ethylhexanoate, Hydrogenated Polyisobutene, Silica Silylate, VP/Eicosene Copolymer, Polypropysilsesquioxane, Cellulose, Ethylene/Propylene Copolymer, Propylene Carbonate, Glyceryl Caprylate, D&C Black No.2 (CI 77266), Sorbitan Isostearate, Polymethylsilsesquixane, Triethoxycaprylysilane, Aqua (Water), Ceramide NP, Tocopheryl Acetate, Camellia Sinensis Leaf Extract, Butylene Glycol, 1,2-Hexanedioal, Phenoxyethanol, Hydrolysed Collagen, Artistotelian Chilensis Fruit Extract, Euterpe Oleracea Fruit Extract, Fragaria Chiloensis (Strawberry) Fruit Extract, Lyceum Chinese Fruit Extract, Morus Nigra Fruit Extract, Ribes Nigrum (Black Currant) Fruit Extract, Rubus Coreanus Fruit Extract, Rubus Fruticosus (Blackberry) Fruit Extract, Rubus Idaeus (Raspberry) Fruit Extract, Vaccinium Macrocarpon (Cranberry) Fruit Extract, Vaccinium Myrtillus Fruit Extract, Ethylhexylglycerin. 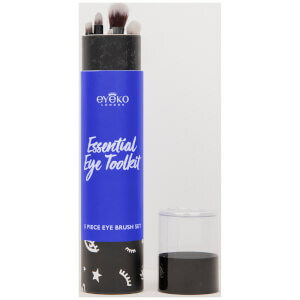 Receive a FREE Eyeko Eye Brush Set when you spend £25 or more on Eyeko.